If you’re in San Diego and you love books, you shouldn’t miss the 3800 block of Fifth Avenue in Hillcrest. 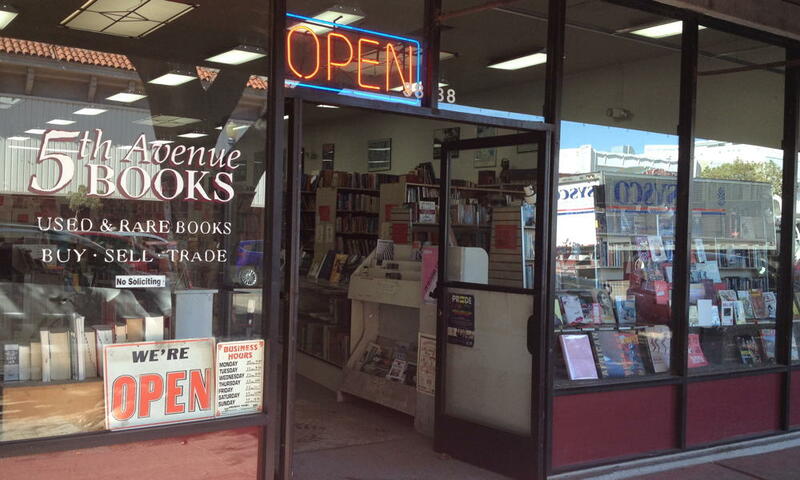 Since the closing of all but one bookstore on Adams Avenue, this has become book central for San Diego. While it still existed, the San Diego Book Festival moved from Adams Avenue to this block. Alas, the book festival is no more, as far as I can tell. But these two great bookstores still face each other across the street. If this is your first time there, you’ll likely spend a good part of your day, if not your entire day, in this area. Bluestocking Books is the smaller of the two. In the front, next to the long checkout counter, is a fine collection of cookbooks. On the right, children’s and humor books set up centrally to draw the attention of kids. Elsewhere, they have a well-curated collection of history, sociology, and counter-culture. And in the back a very nice collection of science fiction/fantasy and classics of literature. They’re very friendly; if you need something and you’ll be in the area for a while, they will happily order it. Across the street, Fifth Avenue Books1 is large, spacious, and well-organized, and they also have a very good selection of science fiction, fiction, and history, as well as cookbooks and art and quite a bit more. They run a bit more expensive than I normally like, but that’s mainly because they know what they have. I found two Jack Vance books I wanted to read on my latest visit. Eyes of the Overlord for six bucks and The Dying Earth for five. I ended up getting the latter, because it had a cooler cover and was a buck cheaper. I’ve also picked up a whole bunch of Lovecraft here in their backroom, and several nonfiction books in the front shelves. Seeing Lawrence Block’s Telling Lies for Fun & Profit on the list reminds that, not on the list, I picked up his wonderful Writing the Novel here long ago, loaned it to a friend and never saw it again.2 That book was part of the inspiration I needed to actually finish my first novel. As with the other San Diego bookstore I’ve reviewed, the low purchase count is not because these aren’t great bookstores, but because I started shopping here long before I started keeping my database. I moved into Hillcrest, a few blocks away from these bookstores, on New Year’s Day 1999. I didn’t start my book database until about 2010.3 That’s also why there is a preponderance of cookbooks in this list. It isn’t that these stores specialize in cookbooks (though they each have a very nice selection), but that I started the cookbook database in AppleWorks over a decade before I started the general book database that powers these reviews. There is also a lot more in this neighborhood. If you’re a fan of vinyl or just love purchasing music, around the corner on Sixth Avenue is Record City, a very friendly, reasonably-priced record store with a nice selection of vinyl and some CDs as well. If you need a hat, walk around to Fourth Avenue for the Village Hat Shop. And, if you’re a walker, don’t forget Footnote Books several blocks down University. When you’re hungry, look for Alexis Greek Café, Pho Fifth Avenue, Tandoori Hut, Hong Kong Restaurant, or Khyber Pass to relax with your finds. There are also dozens, literally, of other great places to eat in walking distance of these bookstores. It’s the center of the Hillcrest community. If, somehow, you don’t spend the entire day looking at books and records, you’ll probably still spend the remainder of your day here, eating, shopping, or just wandering. Sadly, only a few months after I wrote this review, it looks like Fifth Avenue Books is about to close its doors. Apparently, it “has been losing money for several years, most recently about $1,000 a week” and will close at the end of this month. 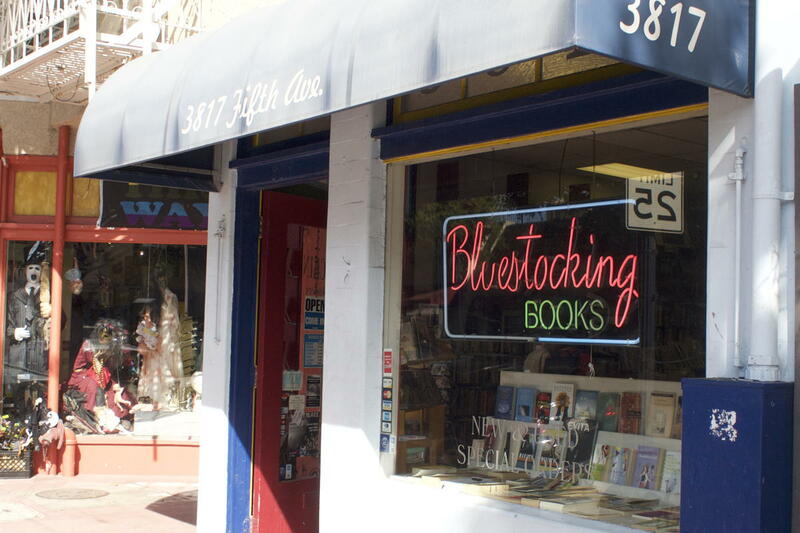 That’s too bad, and I worry it will affect Bluestocking Books as well: the existence of two good bookstores across the street from each other is one of the reasons I always hit this area when I visit San Diego. Apparently, according to the article, they’ve already used crowdfunding once to stay open. Used bookstores are in some ways the unwanted stepchild of the publishing industry. The only one who makes any money when a used book is sold is the seller—not the author, not the publishing house, not the printer. The existence of a used-book market is an incentive to buy new books. Just as the existence of a used-car market is an incentive to buy new cars: because the purchaser knows they can recoup a small amount of their money later if they wish. The existence of a used-item market is very important for items that get cycled through regularly, as many do with cars, and most do with books: even those of us who have lots of books eventually run out of room and need to consolidate our library. Just knowing that I don’t have to dispose of my unused books by trashing them is a benefit. And of course many times we’ll read a book and realize we’re never going to read it a second time. This is one of the reasons I tend to avoid ebooks: there is no easy used ebook market. According to the store’s Facebook page, they currently have books at 80% off and there’s an “employee anti-starvation fund” you can donate to. They call themselves “Fifth Avenue Books” on their Facebook page, but “5th Avenue Books” on their storefront. I’ve since replaced it with a copy from Powell’s in Portland. You will occasionally see earlier purchase dates in these reviews, if I bought them at a memorable event, such as a convention or road trip. I’ve only been to one of the Las Vegas locations once, but I have bought far, far, too much at the San Diego location. It’s friendly, quiet, and a great place to browse vinyl. I rarely go in there without carrying a handful of records out. A crowded, tiny bookstore off the edge of Hillcrest in San Diego, this is a very good bookstore with very little space. Where do good ideas come from? Master “creative procrastination” by reading this book. The first really inspirational book on writing that I read, it was inspirational mainly because it was filled with practical advice. I lost it once, and made sure to replace it. A couple of weeks ago, in San Diego’s wonderfully sunny September, I posted a photo looking over the canyon. Here is a similar photo from yesterday morning, showing our other season. September was Sunny & Mild, we are now in Misty & Mild. We do, technically, have a rainy season, but our rainy season is mostly Sunny & Mild. Why isn’t Bob Filner resigning? Because he thinks he can get away with it—and chances are, he’s right. The watchdog media becomes a lapdog media where Democrats are concerned, especially when those Democrats are in contested areas. Looks like San Diego city councilman Carl DeMaio is backing an expansion of the convention center to ensure that Comic-Con stays in San Diego. The anchor, who I can’t pick out of the Channel 6 line-up, mentions both Anaheim and Vegas as places that would like to entice the convention away. Give them this: when everybody else’s cell phones were dying, my iPad and Verizon allowed me to make fun of SDG&E’s twitter feed throughout the night. San Diego: 5th Avenue Books and Bluestocking Books last modified February 15th, 2017.